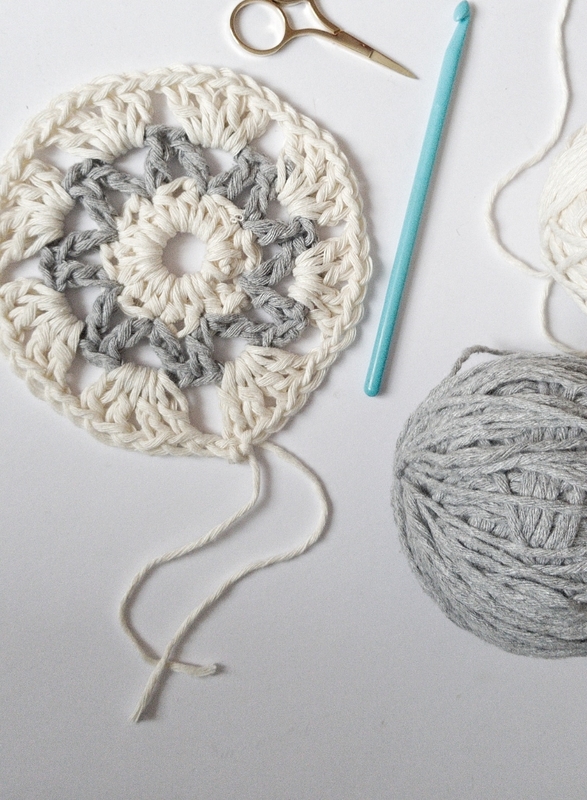 Tutorial for crocheted Granny Square - Read more! 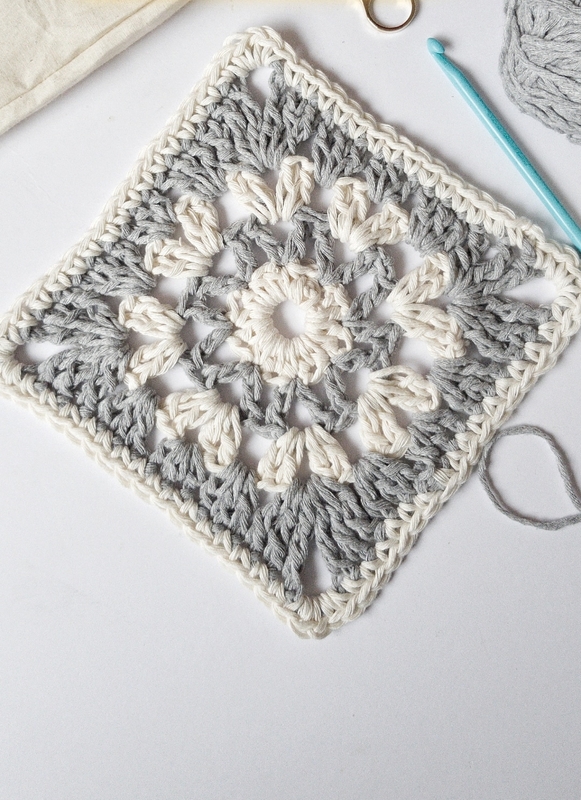 The Grandma’s tile, better known as Granny Square, is an evergreen … which of you does not have at least one at home? It is very versatile and can be used to do anything, from super-colorful 70’s blankets to gorgeous garments. In recent weeks, we have hosted some stories on our Instagram profile, made for us by some of our favorite “makers”. Lily of @Knothing_Usual (do you remember? Lily had also written a pattern for us to make a crochet bag! 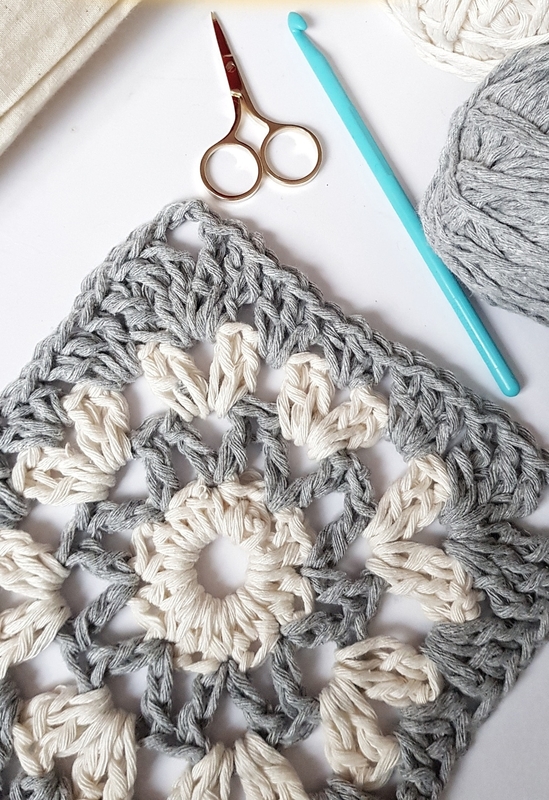 You can find it in this post …) offered us a simple tutorial, to create a variation of the classic Granny Square tile, which she called “Be a Star”. 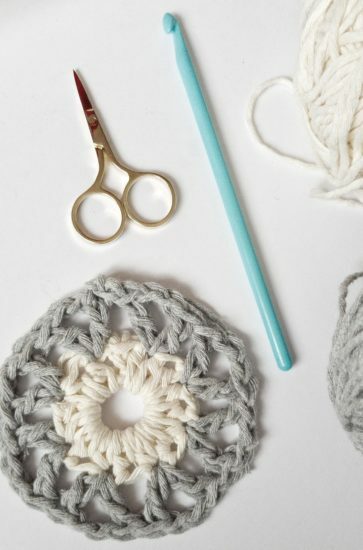 What do you need to make the Granny Square tile “Be a Star”? Prato Cotton yarn (our 100% recycled cotton, of which already talked about here!) in two colors: Ecru and Pearl. 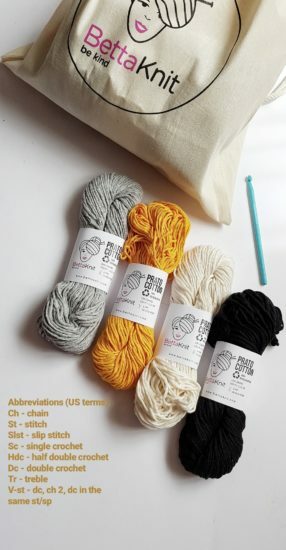 Prato Cotton is particularly suitable to be crocheted, and you will be delighted in the colors, having a very beautiful and lively color chart! Slip Stitch = slst. – go to this video to refresh your memory! Half Double Crochet (UK Half Treble Crochet) = hdc. Treble Crochet (UK Double Treble Crochet) = tr. With color Ecru, ch. 7 and join with 1 slst. to form a circle. Round #1: ch. 2 (counting as hdc. ), 15 hdc. (s) into the centre of the circle, join with slst. into the 2nd ch. from beginning of this round (16 hdc.). Cut the yarn. Round #2: with color Pearl, standing dc. 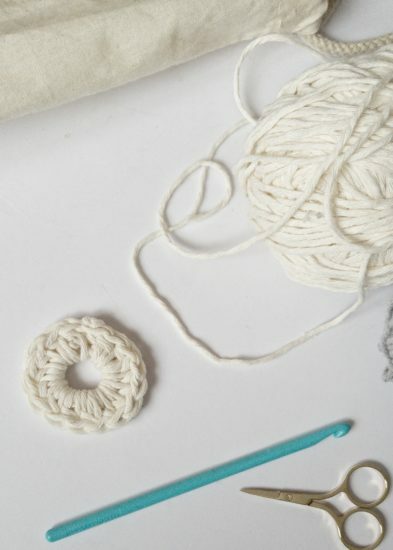 in any stitch, ch. 2, dc. in the same stitch, skip 1 stitch, then *V-Stitch (1 dc., ch. 2, 1 dc. ), skip 1 stitch*. Repeat from * to * 7 times, join with slst. into the dc. from beginning of this round (16 dc. – 8 ch. 2 space). Cut the yarn. Round #3: with color Ecru, standing dc. in any ch. 2 sp., 1 dc., ch. 1, 2 dc. in the same space, ch. 1, then *2 dc. in the next ch. 2 sp., ch. 1*. Repeat from * to * 7 times, join with slst. into the dc. from beginning of this round (32 dc. – 16 ch. 1 space). Cut the yarn. We are close to the end! Round #4: with color Pearl, standing hdc. in any ch. sp., 2 more hdc. in the same space, 3 dc. in the next ch. 1 sp. Then 3 tr. in the next ch. 1 space, ch. 3, 3 more tr. in the same space, 3 dc. in the next ch. 1 sp. Then *3 hdc. in the next ch. 1 sp., 3 dc. in the next chain 1 sp., 3 tr. in the next chain 1 sp., ch. 3, 3 more tr. in the same space, 3 dc. in the next ch. 1 sp.*. Repeat from * to * 7 times, join with slst. into the hdc. from beginning of this round (24 tr. – 24 dc. – 12 hdc. – 4 ch. 3 space). Cut the yarn. Round #5: with color Ecru, standing sc. in any ch. 3 sp., sc in the same space, ch. 1, 2 sc. in the same space, 1 sc. in the next 15 stitches. Then *2 sc. in the ch. 3 sp., ch. 1, 2 sc. in the same space, 1 sc. in the next 15 stitches*. Repeat from * to * 3 times, join with slst. into the sc. from beginning of this round (76 dc. – 4 ch. 1 space). Cut the yarn. Your “Be a Star” Granny Square is ready! We hope yoiu enjoyed in making it… and by the way, did you enjoy it? We are asking to be sure ;-)! Now, you can do more and more, perhaps using all the leftovers of Prato Cotton you have at home, and make a beautiful pillow cover, a wonderful ’70 blanket … or whatever you have in mind! You have no leftover of Prato Cotton ?! Well, with a hook of a smaller size, the result will be amazing even with Pima Cotton! 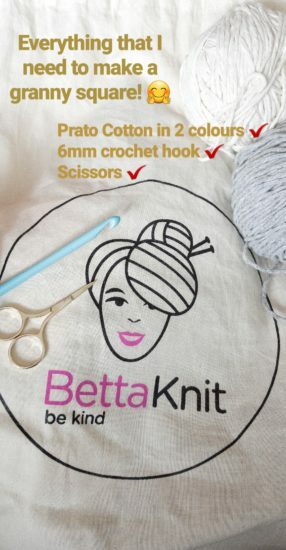 Remember to share your projects and tag #bettaknit and #knothing_usual!